There are recipes for them everywhere. The official Oreo website recipe says to dip them in semi-sweet chocolate. Well that's good, but they go to a whole new level when you dip them in white chocolate. I really don't like dipping things in chocolate - white or brown. But I really like Oreo Truffles. And I want them to look good. I thought you might be just like me. So I'm going to show you how I make them somewhat beautiful. And how I make it a relatively painless process to make them. 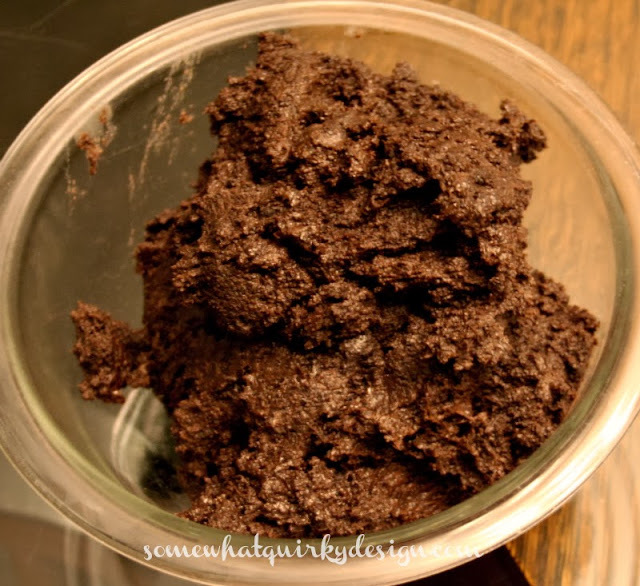 Grind up cookies in a food processor. 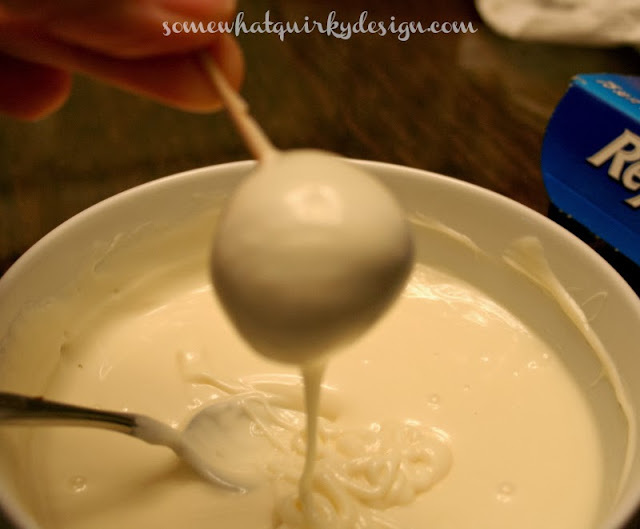 Cut the cream cheese into chunks and process with the cookies. Mix completely. Your processor will start to growl and the ball of dough will thump. Put the mix in a bowl, cover, and refrigerate at least 1 hour. It will look like this. Except it won't be blurry. 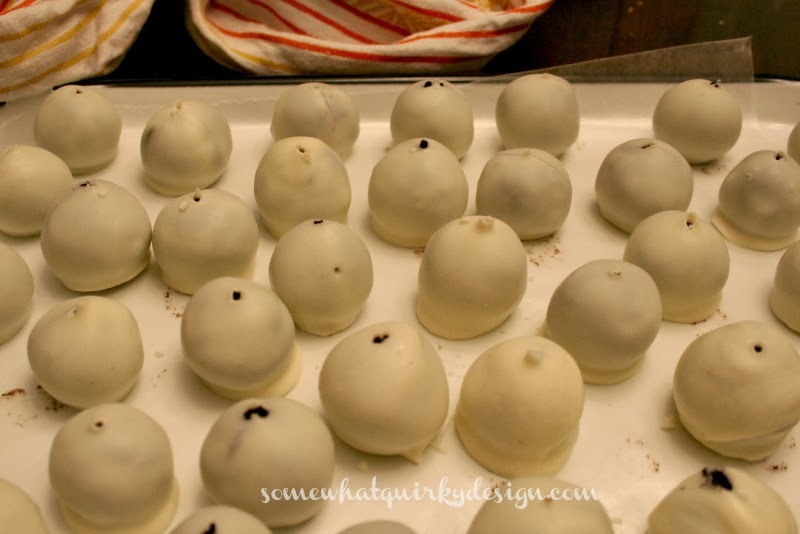 Make approximately 48 little balls and place them on a tray or cookie sheet covered in wax paper. Lay a piece of wax paper over the top and freeze for at least one hour. 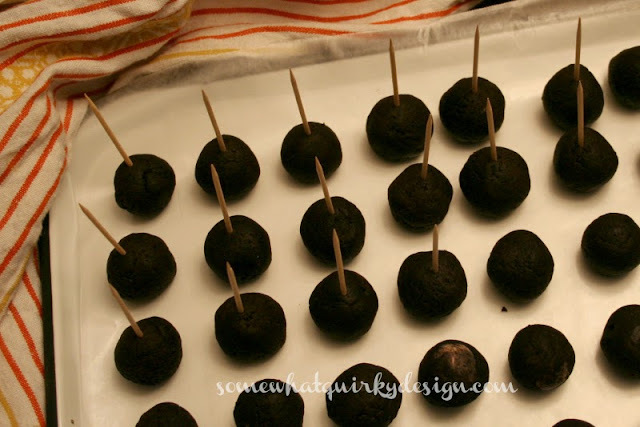 Take the truffles out of the freezer, put a toothpick in the center of 1/2 of the truffles. Put the other half back into the freezer. If the truffle thaws before you dip, it will slip off the toothpick and that will be messy. Put the white chocolate chips in a microwave safe bowl. Add no more than 2 tsp of cooking oil. Microwave on 50% power 30 seconds at a time until chips are melted. I don't use those melting chips because they don't taste as good as white chocolate, and well, they're made of weird stuff that I don't know what is. Dip the truffles, one at a time, into the melted chips. Do not adjust your set. Taking a picture with your right hand while you dip and drip a truffle is difficult. And makes for blurry pictures. 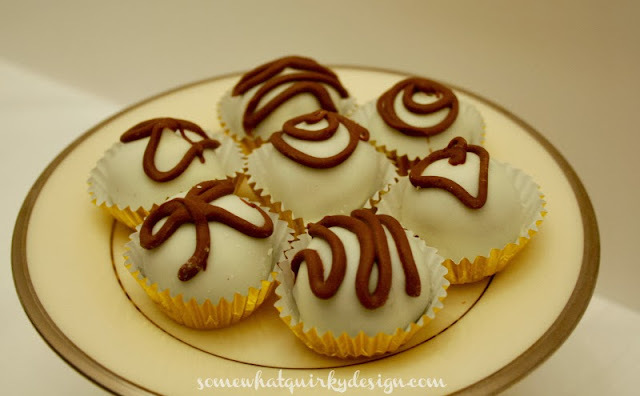 Shake off as much chocolate as you can and then place on wax paper (or parchment paper). I don't like it when I get those huge drip sections at the bottom of the truffle. Those happen when I leave too much chocolate on the truffle. It's not the end of the world or anything. They just look better without it. When you have finished dipping you will need to pull out the toothpicks. Do this by putting the fingers of one hand close to the toothpick and pulling it out with the other. Put a little pressure on the top of the truffle like you are trying to hold it together. This helps prevent cracking of the chocolate - which can happen. But don't worry because you can cover it up. Now you have to cover up your mistakes the holes. Put some milk chocolate chips into a zip lock baggie. Lay the baggie into a bowl of hot water and microwave until the chips are mostly melted. Take out the baggie, dry it off, and massage it little to help the rest of the chips to melt. When all the chips are melted cut off a LITTLE TINY tip of one of the corners. Then do some random decorating. 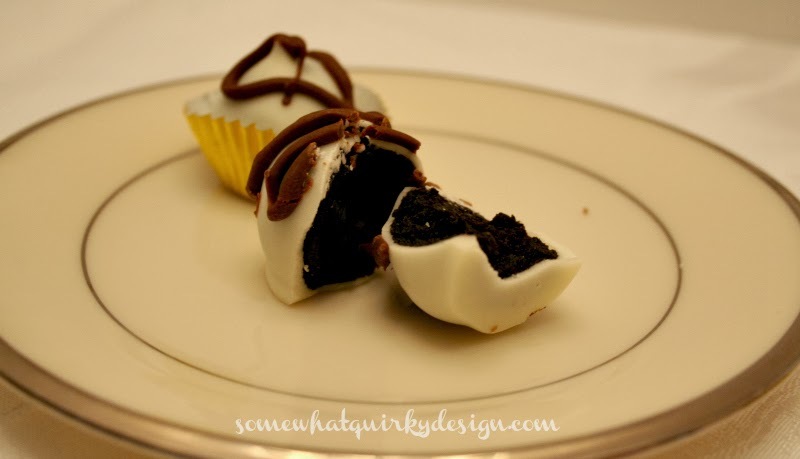 Gently pipe the chocolate on to the truffle. Begin your decoration at the toothpick hole so you make sure it gets covered. 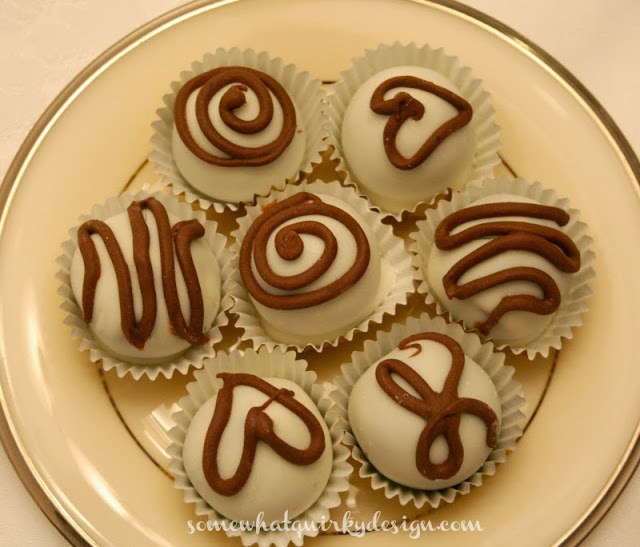 If you have cracks in any of the truffles use the back and forth squiggle decoration, making sure one of your lines covers the crack. Note: If you are using milk chocolate for decorating, it will not harden as quickly as other chocolates. Try to keep the truffles from touching each other because it will smear. And smearing is ugly. I like to put these in little candy cups. They just look prettier that way. Store in the refrigerator. Serve at room temperature. If you haven't ever had these you are missing out. So you won't miss out. I think I just may have to try making these - your wonderful (even if they are somewhat blurry) photos sold me! Thanks! This is not good that I discovered your truffle recipe. They look like one of those things that I will eat way too many of. I love your idea for how to cover up the holes. 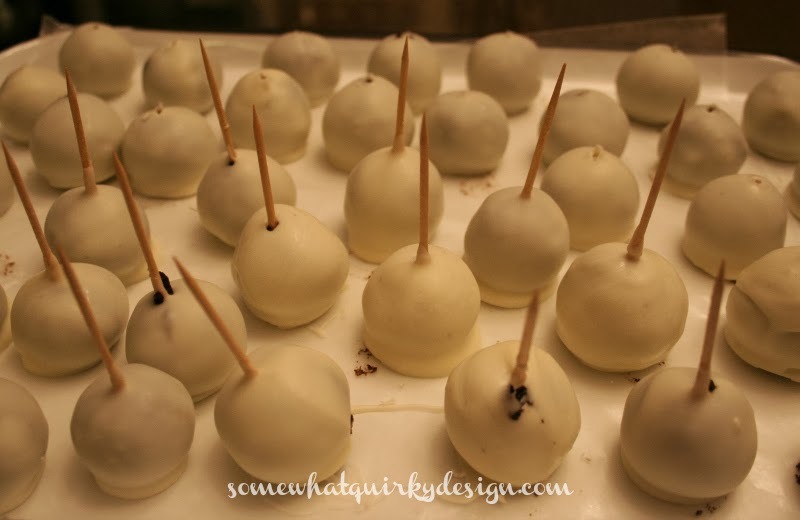 I am going to use that on the Buckeyes I make at Christmas. 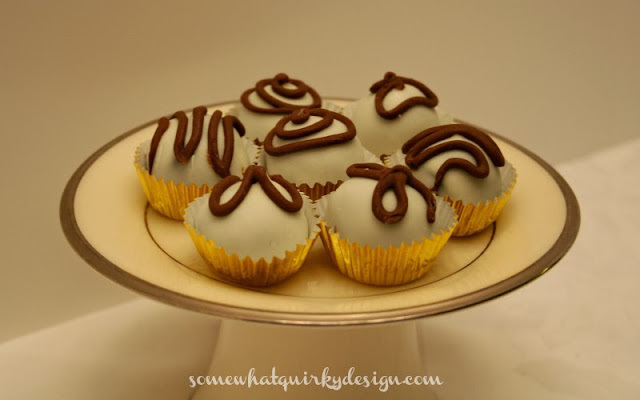 I like your method of placing the truffles in the freezer for dipping - and they're pretty! 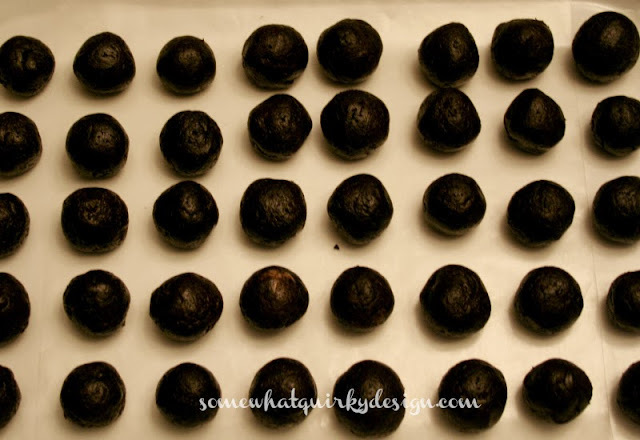 I made these last year and they were oh so good, but the recipe was tedious, the cookies globbed up the processor one other time when I made the oreo 'dirt' truffle, so I crumbled mine in a ziploc with a rolling pin for these. I melted the white chocolate in small batches (I used Ghirardelli's squares, it hardens so quickly! ), and rolled the tops in some reserved crumbles. I'll have to try your way this year! Thanks! Look at you all multi-tasking taking photos and dipping at the same time!! These look and sound awesome girl! Nice decorating too! My daughter makes a variety of truffles every year, the oreo too of course. I prefer my oreos plain, but I've been known to pop more than my fair share of the truffles into my open mouth. I am not sure I would need to store them, they wouldn't last that long ! Yum, you have to make that for me someday!